Elgar's Enigma Theme Unmasked: Elgar's Covert Theme: "Ein feste Burg"
The Enigma I will not explain – its ‘dark saying’ must be left unguessed, and I warn you that the connection between the Variations and the Theme is often of the slightest texture; further, through and over the whole set another and larger theme ‘goes’, but is not played…So the principal Theme never appears, even as in some later dramas – e.g., Maeterlinck’s ‘L’Intruse’ and ‘Les sept Princesses’ – the chief character is never on the stage. The elusive melody to Elgar’s Enigma Variations has been the subject of endless speculation, prompting prominent scholars like the late Michael Kennedy to profess, “People have ingeniously been trying to guess the tune ever since, a harmless but pointless recreation since the secret, if there was one, died with him.” J. P. E. Harper Scott reiterates that opinion more flamboyantly, “Although human nature guarantees that attempts to solve it will never end until the Ark of the Covenant and the Holy Grail are on permanent display at the British Museum…the riddle cannot be answered now its perpetrator is dead…” With few exceptions the scholarly consensus maintains the correct melodic solution is impossible to discover or authenticate because Elgar presumably took his secret to the grave without leaving behind some viable form of confirmation. This opinion is predicated on the assumption that Elgar, an expert in cryptography, left behind no cryptograms in the Enigma Variations that conclusively resolve this melodic riddle. Could the conventional wisdom be wrong? As no mainstream Elgar scholar is a recognized expert in cryptography, there is ample reason to doubt their collective doubt. 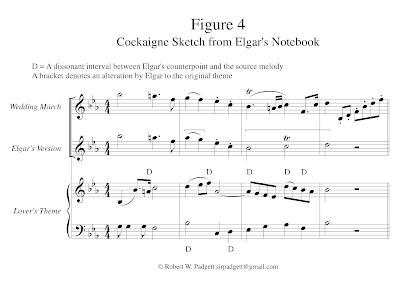 The basis for such skepticism is that it is not only conceivable, but infinitely probable, Elgar encoded the answer to his enigma within the score itself. Before attempting to navigate the melodic labyrinth posed by the Enigma Variations, it is first necessary to establish the parameters of the puzzle, specifically six conditions set forth by Elgar that must be satisfied by the correct tune. The failure to methodically identify those conditions largely explains why all prior attempts to unravel the conundrum have produced a divergent medley of discordant melodies. Absent a concrete set of carefully defined conditions, there can be no realistic prospect of uncovering and validating the correct answer. As one astute philosopher observed, “Getting the question right is the answer.” After identifying and precisely defining those conditions, some cryptographic evidence from the orchestral score implicating Martin Luther’s Ein feste Burg (A Mighty Fortress) will be described. This will be followed by mappings of that hymn over Nimrod and the Enigma Theme with an assessment of how effectively it fulfills all of Elgar’s conditions. It is true that I have sketched for their amusement and mine, the idiosyncrasies of fourteen of my friends, not necessarily musicians; but this is a personal matter, and need not have been mentioned publicly. The Variations should stand simply as a ‘piece’ of music. The Enigma I will not explain – it’s ‘dark saying’ must be left unguessed, and I warn you that the connexion between the Variations and the Theme is often of the slightest texture; further, through and over the whole set another and larger theme ‘goes’, but is not played…So the principal Theme never appears, even as in some later dramas – e.g., Maeterlinck’s ‘L’Intruse’ and ‘Les sept Princesses’ – the chief character is never on the stage. Elgar plainly states the Theme may be played through and over the entire set of Variations, yet remains silent with often the slightest connection between them. Only a musical theme may be played, unlike those of a literary, symbolic or mathematical nature. In 1923 Troyte Griffith, the friend portrayed in Variation VII, asked if the missing melody was God save the King. Elgar replied, “No, of course not; but it is so well-known that it is extraordinary no one has spotted it.” Besides establishing its fame, such a reply suggests that fragments of the absent Theme are present in the Variations, for otherwise there would be nothing to spot. This hunch is bolstered by the original program note that describes the link between the absent Theme and the Variations as being “…often of the slightest texture...” Merriam-Webster defines slight as “very small in degree or amount”, and one definition for texture is “the various parts of a song…and the way they fit together.” Elgar’s judiciously parsed words specify the discernible bond between the Variations and the absent Theme is comprised of short sequences of shared notes or fragments. This condition is further alluded to by the brief four-note Mendelssohn fragments quoted in Variation XIII. Notice the terms phrase and theme are used interchangeably in the context of a melody that may be added above the original Enigma Theme. This narrative dovetails precisely with the original program note stating “…through and over the whole set another and larger theme ‘goes’, but is not played…” Only a musical theme can be played, a quality irreconcilable with something symbolic, figurative, mathematical, or literary. The insistence by some that the solution could be something other than a famous melody is utterly incompatible with this stipulation. Whatever this book states as fact may be accepted as such. The sayings of Elgar are recorded in the actual words addressed directly to the writer, and upon these I rely to give to the book an interest it would not otherwise possess. The ‘Enigma’ orchestral-piece is Op. 36. What the solution of the ‘Enigma’ may be, nobody but the composer knows. The theme is a counterpoint on some well-known melody which is never heard, the variations are the theme seen through the personalities of friends, with an intermezzo and a coda, the last added at the request of friends aided and abetted by Dr. Richter, who accepted the work on its merits, having received the score in Vienna from his agent in London, and who at the time had not met with the composer. I do not see the tune you suggest fits in the least. Merriam-Webster defines the verb fit as “to be suitable for or to harmonize with”, and “to conform correctly to the shape or size of.” Elgar’s language leaves no room for doubt. Both themes must be same length with a suitable counterpoint. The final condition comes from descriptive notes Elgar supplied for a set of pianola rolls published in 1929. Concerning the first Variation he wrote, “There is no break between the theme and this movement.” That disclosure is crucial because it confirms the Enigma Theme does not end until Variation I begins. As the first variant of the Enigma Theme is not introduced until measure 20, this would mean he defined the length of the Enigma Theme as the opening nineteen measures. The two bar bridge in measures 18 and 19 does not belong to Variation I (something deceptively implied by the layout of the score), but rather represents an elaboration of the Enigma Theme’s closing cadence. A conspicuous tie between the notes of measures 17 and 18 supports this observation, linking the Enigma Theme and the bridge in a way not found with Variation I. The bridge serves to unwind the Picardy cadence, returning it back to the minor mode in preparation for the first variation from which it is separated by a conspicuous double bar. At first glance measure 17 only appears to mark the end of the Enigma Theme, but in light of Elgar’s published statement it is in reality a faux ending. The correct melodic mapping of the covert principal Theme must account not only for the Enigma Theme’s Ternary ABA structure in measures 1 through 17, but also the two bar bridge (Section C) in measures 18 and 19 that precede the launch of Variation I. The Enigma Theme is a counterpoint to the principal Theme. The principal Theme is not heard. The principal Theme is famous. Fragments of the principal Theme are present in the Variations. The principal Theme is a melody that can be played through and over the whole set of Variations including the entire Enigma Theme. 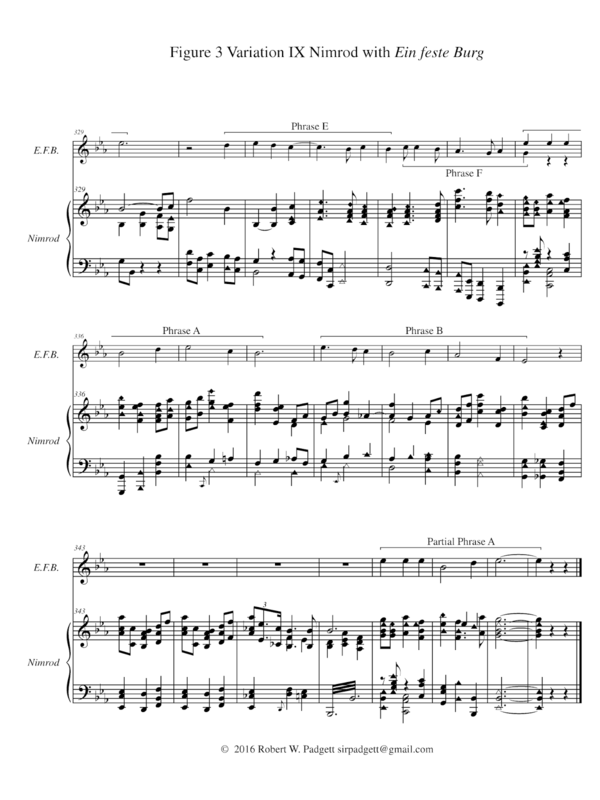 The Enigma Theme comprises measures 1 through 19. Any alleged solution that violates any of these six conditions may only be proffered in direct conflict with the recorded words of the composer by multiple, independent, unimpeachable sources. In light of these conditions, all prior melodic solutions may be safely ruled out as unsound because they invariably overlook the bridge in measures 18 and 19. This clears the decks for a new solution, but which tune out of a vast sea of possibilities could conceivably satisfy all of these exacting stipulations? A fresh reassessment of the anomalous Mendelssohn fragments in Variation XIII yields a surprising answer. A proven code breaking technique is to concentrate on the anomalies, sifting them for clues that may help unlock a cipher. With this investigative strategy in mind it is worth examining the most conspicuous anomalies in the Enigma Variations. These appear in Variation XIII with its cryptic subtitle of three asterisks (***) and four seemingly extraneous fragments from Felix Mendelssohn’s concert overture Meerestille und Glückliche Fahrt (Calm Sea and Prosperous Voyage). Two fragments in A-flat major and a third in E-flat major are enclosed in quotations as they appear in the original major mode, while a fourth in F minor appears without quotation marks. 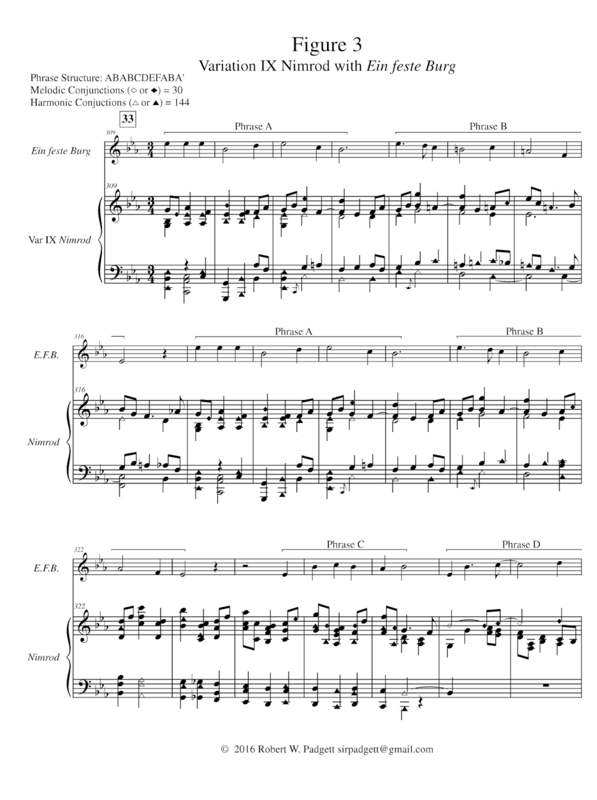 These four fragments in three keys are performed with a pulsating ostinato that mirrors the Enigma Theme’s palindromic pairings of crotchets and quavers, a feature implying some deeper connection to the puzzle. The Mendelssohn fragments are manifestly anomalous because they come from an unrelated work by a different composer and, apart from the rhythmic accompaniment depicting the undulating sea, evince no apparent connection to the Enigma Theme. On closer inspection it was found the Mendelssohn fragments conceal numerous cryptograms. The most basic cipher is conveyed by their key letters (A, E, and F), an anagram of the well-known music cryptogram F.A.E. Those three notes serve as a foundational motive for a violin and piano sonata composed collaboratively by Robert Schumann (Elgar’s “ideal” composer), Johannes Brahms, and Schumann’s pupil Albert Dietrich. The F-A-E Sonata is dedicated to their friend, violinist Joseph Joachim, whose romantic motto “Frei aber einsam” (Free but lonely) furnished the initials. This code openly concealed in the Mendelssohn fragments is called as the F.A.E Cipher, a three letter code hinted at by the three asterisks in the subtitle. There are some remarkable parallels between the F-A-E Sonata and the Enigma Variations. Schumann composed the second and fourth movements, an Intermezzo and a Finale respectively. The Enigma Variations also have an Intermezzo (Variation X) and a Finale (Variation XIV). When Joachim first performed the F-A-E Sonata for the composers with Clara Schumann accompanying him on piano, he was challenged to guess which friend composed each of the movements. Elgar played a similar game when he performed sketches of the Variations for his friends, challenging them to guess who was depicted in each movement. As a 13-year-old protege of Mendelssohn, Joachim electrified London audiences in May 1844 with his performance of Beethoven’s Violin Concerto in D. In his youth Elgar dreamed of becoming a renowned violinist, so this coded reference to Joachim is entirely plausible, particularly since it is found in fragments composed by his distinguished mentor. The crux of Joachim’s motto about being free but lonely mirrors Elgar’s description of the Enigma Theme capturing his “sense of the loneliness of the artist.” The rudimentary encryption of a recognized music cryptogram in the Mendelssohn fragments strongly suggests they harbor additional ciphers. Many have pondered why Elgar would so conspicuously quote Mendelssohn’s overture in Variation XIII without arriving at a satisfying answer. By repeatedly quoting an overture with an original German title, Elgar deftly implies two things: 1) Mendelssohn quotes the absent Theme in one of his other symphonies, and 2) That mysterious theme’s original title, like that for Mendelssohn’s work, is comprised of multiple words in German. Encoding Joachim’s motto in those same fragments further suggests the original title of the secretive theme is three words in German. The three asterisks in the subtitle and three fragments in quotations both hint at this prospect. There is a popular concert overture composed by someone who shares the name Joseph Joachim whose early music was endorsed by Felix Mendelssohn. The concert overture Ein feste Burg ist unser Gott by Joseph Joachim Raff was premiered in 1865, featuring a set of variations on Luther's epic hymn. Like Elgar, Raff was an autodidact. By encoding the initials for Joseph Joachim's motto in fragments drawn from Mendelssohn's concert overture, Elgar cleverly alludes to the title of another well known concert overture by someone with the name Joseph Joachim who associated with Mendelssohn. The German origin of the absent Theme is highlighted by other curious features of the Variations. At Elgar’s behest the title Enigma was added to the original score by his German friend, August Jaeger, so nobly depicted in Variation IX as Nimrod. While presumably in English, enigma is spelled identically in German. 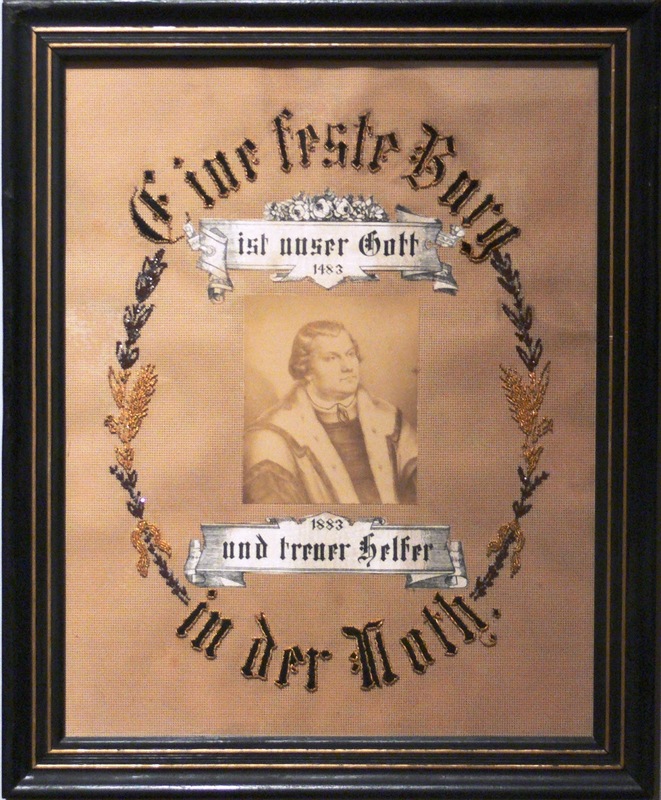 As this baffling title was written above the Theme by the only German friend portrayed in the Variations, this anomaly implies its German derivation was intended. Elgar’s initials for Variation XIV (E.D.U.) come from the German spelling of his first name, Eduard. The first letters of the German titles for the first and last movements – Enigma and Eduard (E.D.U.) – produce the initials for the composer (E.E.) and frame the entire work in a discernible German context. These German titles and phrases – Enigma, Meerestille und Glückliche Fahrt, Frei aber einsam, and Eduard – all point to a German derivation and title for the absent Theme. Did Mendelssohn ever quote a famous theme with a common three-word title in German? In his Reformation Symphony Op. 107 composed in 1829-30 to commemorate the tercentennial of the Augsburg Confession, the fourth movement opens with a quotation of Martin Luther’s Ein feste Burg (A Mighty Fortress) followed by a set of variations. The number of fragments (4) in Variation XIII neatly pinpoints the precise movement in which Mendelssohn introduces Luther’s rousing hymn. The breakthrough linking Ein feste Burg to the Mendelssohn fragments was made on February 3, 2009, the bicentennial of Mendelssohn’s birth. 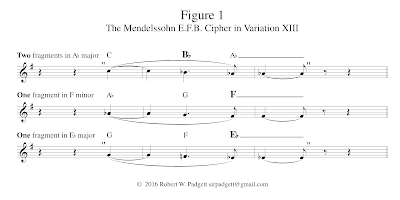 The code implicating Mendelssohn’s symphonic celebration of Ein feste Burg is called the Mendelssohn Fragments Cipher. 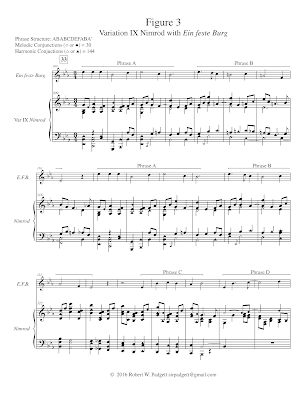 That famous theme is quoted by renowned composers of the German School whom Elgar admired such as J. S. Bach, Felix Mendelssohn, Giacomo Meyerbeer and Richard Wagner. Composing a counterpoint to Ein feste Burg would be entirely consistent with Elgar’s self-professed allegiance to the German School and his known history of writing counter melodies to famous themes by Handel and Mendelssohn. The temptation to disqualify Ein feste Burg – the Marseillaise of the Reformation – based on Elgar’s cultural identity as a Roman Catholic is easily reconciled by the recognition it is only quoted in secret. On closer inspection the Mendelssohn fragments contain a heterogeneous mixture of ciphers that encode a diverse yet discreet set of mutually reinforcing solutions. On one level they allude to the composer of the covert principal Theme because at the age of seven Mendelssohn was baptized a Lutheran on March 21, 1816, the anniversary of the birth of another famous Lutheran composer, J. S. Bach. Delving deeper, the F.A.E. Cipher found in those fragments hints at Luther and his most famous hymn for at least two reasons. The first and more obvious is that Joachim, like his mentor, was Lutheran. The second and less obvious is Joseph Joachim’s initials (J.J.) are the same for an alias adopted by Martin Luther when he disguised himself as “Junker Jörge” (Knight George) while hiding out at Wartburg castle, a bona fide mighty fortress. This Lutheran connection would easily explain why Elgar first identified Variation XIII with a capital L, and only later added the letters ML, the initials for Martin Luther. There is another coded explanation for why Elgar would encipher Joachim’s motto in the Mendelssohn fragments. The initials F.A.E. 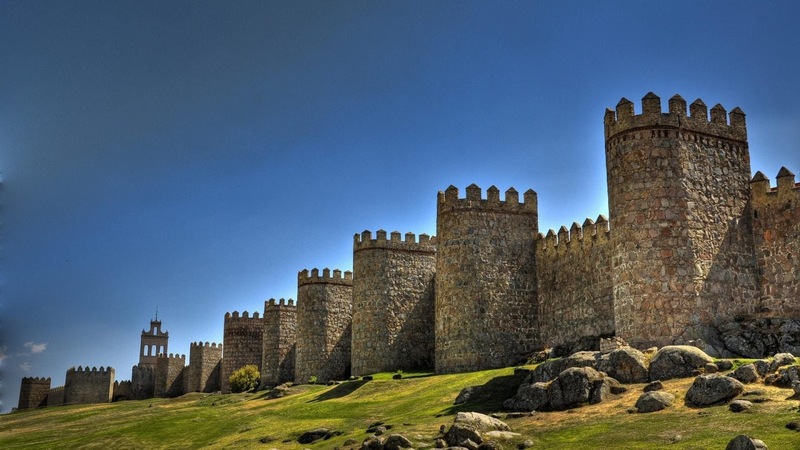 encode the English initials for A Mighty Fortress (A.M.F.). Two of the letters (A and F) are exact matches, while the missing M may be accounted for by reorienting the E facedown. Elgar used this identical procedure with semicircular characters resembling cursive capital E’s in his Dorabella Cipher conceived two years before the genesis of the Enigma Variations. The F.A.E. Cipher hints at the secretive Theme’s three word German title, while its corollary, the A.M.F. Cipher, provides the initials for the literal English translation of Ein feste Burg as A Mighty Fortress. A more sophisticated cipher in the Mendelssohn fragments encodes the initials for Ein feste Burg. The first step in the decryption is to add up the number of times each fragment in stated in a given key. The second step is to count backwards the unique notes in each corresponding fragment based on the number of episodes to reveal the solution letter. Each four note fragment has a repeated note at the end, so for the purposes of this decryption each fragment is condensed to its three unique component notes. The A-flat major fragment consists of three distinct notes (C, B-flat, A-flat) and is played twice. Counting backwards starting from the last note (C = 3, B-flat = 2, A-flat = 1) generates B-flat. The F-minor fragment is made up of three unique notes (A-flat, G, F) and is performed once. Counting backwards starting from the last note (A-flat = 3, G = 2, F = 1) produces F. The final fragment in E-flat major has three unique notes (G, F, E-flat) and is also played once. Counting backwards from the last unique note (G = 3, F = 2, E-flat = 1) yields E-flat. Represented in Figure 1, this alphanumeric code shown is called the Mendelssohn E.F.B. Cipher. It is crucial to observe this cipher encodes the initials for Ein feste Burg in the reverse order of the fragments as they appear in the movement, and that the decryption requires counting backwards in each fragment to identify the three solution letters. It will later be shown how this process of encoding in reverse serves as an important clue regarding how to correctly map the covert principal Theme “through and over” the Enigma Theme. The keys of the Mendelssohn fragments (A-flat, F, E-flat) not only encipher Joachim’s personal motto and the English initials for A Mighty Fortress, they also reproduce the identical melodic intervals formed by the last three notes of Ein feste Burg’s ending phrase from Mendelssohn’s Reformation Symphony. In bar 5 of Mendelssohn’s Finale the last three notes of Ein feste Burg’s concluding phrase as performed by the flute are C descending by a minor third to A followed by a drop of a major second to G. The keys of the Mendelssohn fragments follow this same interval sequence a major third lower with A-flat dropping by a minor third to F, then down a major second to E-flat. This tail fragment from the ending phrase of Ein feste Burg is called the Mendelssohn Keynotes Cipher. With one set of fragments Elgar ingeniously encodes a fourth fragment, one that provides the last three notes of Mendelssohn’s adaption of Ein feste Burg transposed down a major third. The two 3’s in this cipher’s decryption calling for the transposition of three notes down a major third appears to be a coded version of Elgar’s initials because two cursive capital E’s (EE) are the mirror image of two 3’s (33). 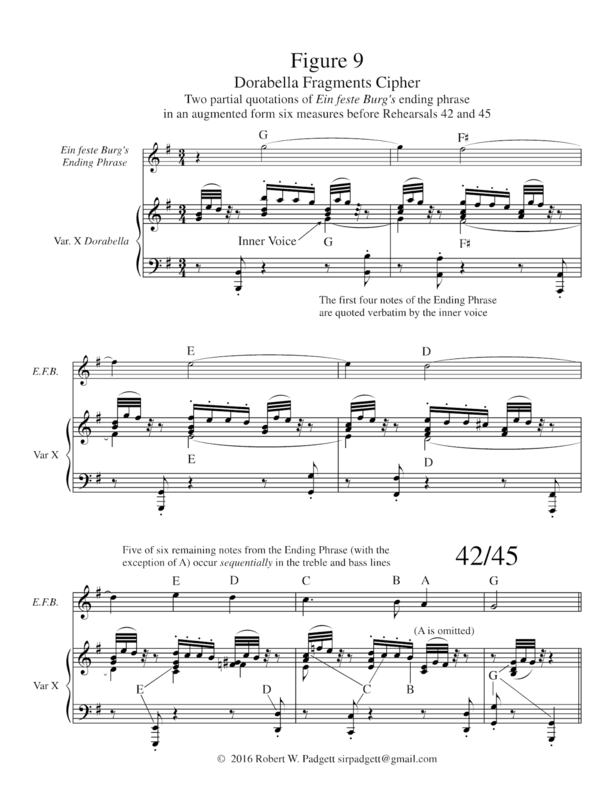 The Mendelssohn Keynotes Cipher provides an important piece of the puzzle because a meticulous analysis of the clarinet solos in A-flat major (starting four bars after Rehearsal 56) and E-flat major (beginning four bars after Rehearsal 60) reveal they are both music anagrams of the complete ending phrase of Luther’s original version of Ein feste Burg. These two clarinet solos begin with a four note fragment from Mendelssohn’s concert overture, and are subsequently enlarged into a complete seven bar phrase. The notes from the A-flat major clarinet solo are “C, B-flat, A-flat, A-flat,” E-flat, D, C, E-flat, F, and G. The duplicate A-flat's in quotations may be reduced to a single note as was done in the decryption of the Mendelssohn E.F.B. Cipher. The two E-flat’s remain because they are an octave apart and convey the composer’s initials. The three unique notes from the A-flat Mendelssohn fragment (C, B-flat, A-flat) along with the remaining six notes of the A-flat major clarinet solo (E-flat, D, C, E-flat, F, G) may be reshuffled to form the complete ending phrase of Ein feste Burg in E-flat major (E-flat, D, C, B-flat, C, A-flat, G, F, E-flat). When applied to the E-flat clarinet solo, this same decryption process replicates this same ending phrase down a perfect fourth in B-flat major. 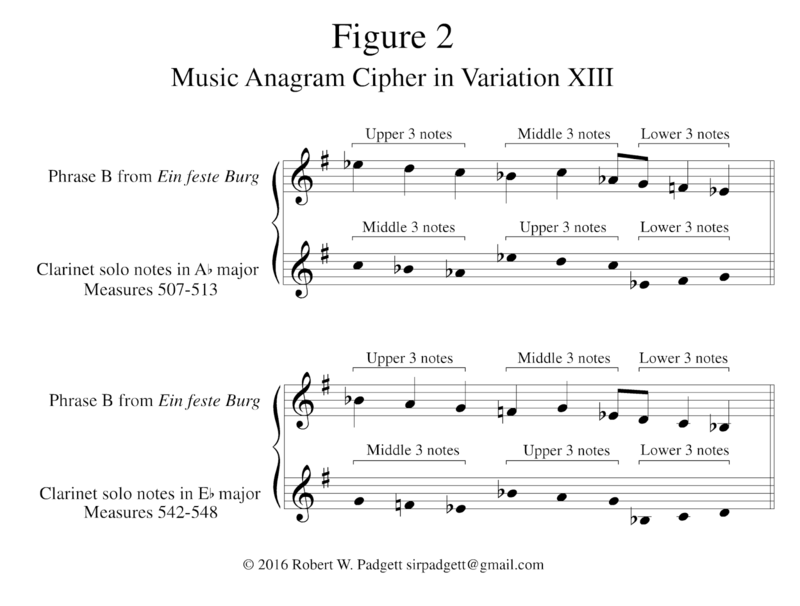 Shown in Figure 2, this particular code is identified as the Music Anagram Cipher. The principal Theme’s absence is paralleled by the absent initials in Variation XIII’s subtitle represented by three cryptic asterisks (***). The solution to this riddle is convenient supplied by the first letters of the subtitles from the adjoining movements, specifically Variations XII (B.G.N.) and XIV (E.D.U. and Finale). Known as the Letter Cluster Cipher, Elgar cleverly frames this riddle with the answer. It is remarkable these are the same letters encoded by the Mendelssohn E.F.B. Cipher in Variation XIII. Those same initials are written twice on the original cover page of the full score. In standard practice the abbreviation for February is Feb, yet on the cover page Elgar wrote the start and end dates of the orchestration as “FEb 5th” and “FEb 19th” respectively. 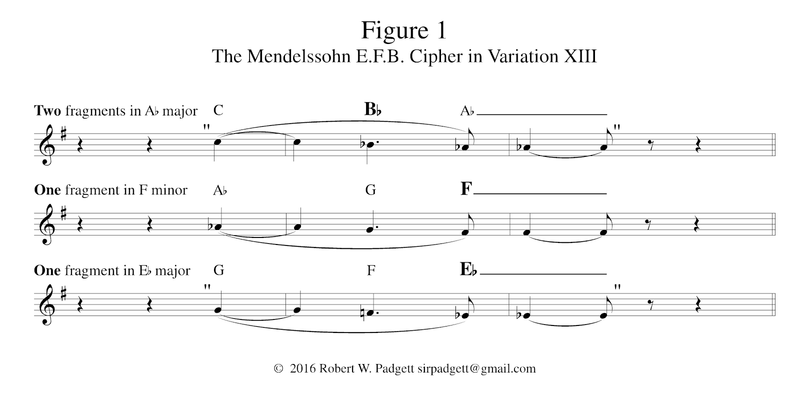 The two capital E’s are a coded version of the composer’s initials, a feature also present in the decryption of the Mendelssohn Keynotes Cipher. The letters “Feb” are an anagram of E.F.B. The initials for the covert principal Theme appear not once, but twice on the cover of the orchestral score. This code is known as the Date Anagram Cipher. At the conclusion of the original score Elgar wrote the incorrect completion date “FEb 18 1898”. This anomaly alludes to Luther and his greatest hymn because “FEb” is an anagram for E.F.B., and February 18th is the anniversary of Luther’s death, his earthly end. This code is called the Enigma Date Cipher. 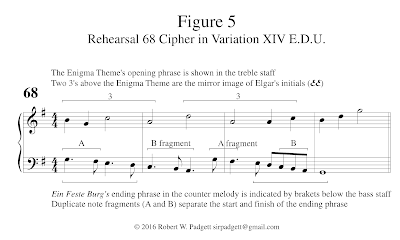 The performance directions in the Enigma Theme’s first measure comprise yet another remarkable cipher pointing to Ein feste Burg as the absent Theme. There are a total of seven performance directions in the inaugural measure, and their first letters (Andante, legato e sostenuto, Piano, and molto espressivo) are an anagram for “EE’s Psalm”. The two EE’s are evidently the initials for Edward Elgar who often initialed rather than signed his correspondence. It was previously shown his initials appear in the Mendelssohn Keynotes, Music Anagram and Date Anagram ciphers. The word Psalm is instructive because it is singular rather than plural, designating a specific chapter from the Biblical text which has 150 chapters. The title for Ein feste Burg comes from the first line of Psalm 46. This chapter number is encoded in reverse by the Enigma Theme’s opening A and B sections which are 6 and 4 measures respectively. The reverse reading of these numbers is implied by the decryption method applied to the Mendelssohn E.F.B. Cipher, and further hints at how the covert Theme should be mapped over the Enigma Theme. This code is identified as the Enigma Psalm Cipher. The Enigma Theme’s A section is in G minor, a key with two flats (B-flat and E-flat). The B section is in G major, a key defined by one sharp (F-sharp). Notice the key signatures of the minor and major modes of G cleverly encipher the initials E.F.B. This particular code is called the Enigma Keys Cipher. It defies the realm of chance that the initials for Ein feste Burg are encoded in at least five different ways in five different places in the score. The letter E is the fifth letter of the alphabet, so these two fives may be construed as another coded reference to Elgar’s initials. The initials E.F.B. 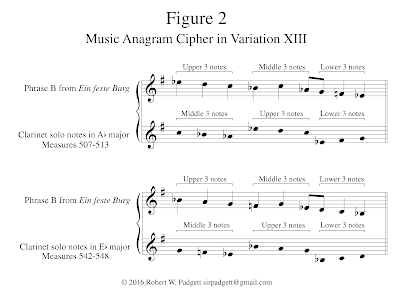 are enciphered by the Date Anagram Cipher on the cover page, the Enigma Keys Cipher in the Enigma Theme, the Mendelssohn Cipher in Variation XIII, the Letter Cluster Cipher in the subtitles of Variations XII and XIV, and the Enigma Date Cipher on the last page of the original score. The complete title of the absent Theme is provided by the Enigma Psalm Cipher which is located in the first ten measures of the Enigma Theme. Elgar’s use of literature is another rich source of cryptography. After Hans Richter conducted the premiere of the Variations in June 1899, in gratitude Elgar gave him a copy of Longfellow’s novel Hyperion. In that “little book” Longfellow mentions the “sublime old hymn of Martin Luther” before quoting the opening stanza of Ein feste Burg. With that book Elgar literally gave away the answer, if only Richter had the time and inclination to read it. At the conclusion of the expanded Finale Elgar quotes a fragment from the fourteenth stanza of Longfellow’s poem Elegiac Verse, “Great is the art of beginning, but greater the art is of ending.” Elgar quotes a literary fragment by Longfellow at the conclusion of Variation XIV for the same reason he quotes a melodic fragment by Mendelssohn in Variation XIII: Both artists cite the covert principal Theme in their respective oeuvre. Besides a passing reference to Martin Luther and Ein feste Burg in Hyperion, Longfellow cites at length each stanza of that epic hymn interspersed with his original verse in the poem Martin Luther. This code is called the Longfellow Fragment Cipher. It is conceivable the initials LML used to identify Variation XIII area coded reference to Longfellow’s Martin Luther. Elgar never officially confirmed Lady Mary Lygon as the dedicatee for this movement, an omission inconsistent with his dedication of Three Characteristic Pieces to her during the same time period when he completed the Variations. Another creative yet indirect use of literature by Elgar is furnished by the Mendelssohn fragments from the concert overture Meerestille und Glückliche Fahrt, a work inspired by the poetry of the German polymath Johann Wolfgang von Goethe. Elgar’s allusion to Goethe on one level conveys his penchant for wordplay. The German pronunciation of Goethe shares striking similarities with Luther. Both last names are two syllables. The “oe” from Goethe sounds like “u” in Luther, and “ther” in Luther sounds almost like “the” in Goethe. At face value it appears Elgar obliquely invokes the name of one great German writer to allude to another renowned for his hymns and historic German translation of the Bible. In his poem Prometheus, Goethe draws from Luther’s distinctive translation of the phrase “When I was a child” (Da ich ein Kind war) from Saint Paul’s First Epistle to the Corinthians. Just as Mendelssohn quotes a fragment from Luther’s most famous hymn, Goethe similarly cites a fragment from Luther’s greatest literary project, the Luther Bible. More remarkable still is the fragment grafted onto Goethe’s poem was translated while Luther was hiding out at Wartburg Castle, a genuine mighty fortress. These coded insights are collectively known as the Goethe Fragment Cipher. The unusual nickname Elgar gave to his friend August Jaeger in Variation IX – Nimrod – is an example of another anomaly that turns out to be a multilayered cryptogram. In the Genesis account Nimrod is described as “a mighty hunter before the Lord.” A cursory explanation for Elgar’s odd nickname is the German word Jaeger means hunter, a description associated with Nimrod. Elgar’s focus on the word hunter is significant since it implies this peculiar moniker is a promising place to hunt for the solution. Nimrod’s biblical depiction is six words in length (“a mighty hunter before the Lord”), a characteristic also shared by the full title for A Mighty Fortress (Ein feste Burg ist unser Gott). Notice also that the first two words of Nimrod's biblical description are exact sequential matches with the title A Mighty Fortress. Nimrod founded a vast kingdom in which he designed and built fortified cities like Babel and Nineveh. According to extra-biblical tradition he oversaw the construction of the Tower of Babel. The name Nimrod is so closely associated with fortifications that a medieval castle on the southern slopes of Mount Hermon is called Nimrod Fortress. 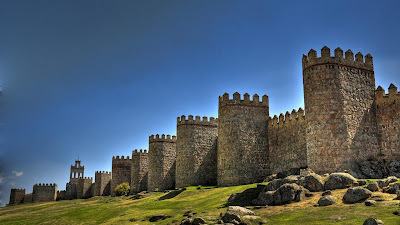 By combining the first two words of Nimrod’s biblical description (“a mighty”) with a term synonymous with his name (fortress), it is possible to construct the title A Mighty Fortress. Variation IX is dedicated to Elgar’s German friend, so translating this English reconstruction into German yields the covert Theme’s common three-word title, Ein feste Burg. This code is known as the Nimrod Cipher. This analysis of the Enigma Variations revealed the presence of at least thirteen cryptograms that implicate Ein feste Burg as the covert Theme: The F.A.E., A.M.F., Mendelssohn Fragments, Mendelssohn E.F.B., Mendelssohn Keynotes, Music Anagram, Letter Cluster, Enigma Keys, Enigma Date, Enigma Psalm, Longfellow Fragment, Goethe Fragment and Nimrod Ciphers. No less than four of those ciphers contain Elgar’s initials (Mendelssohn Keynotes, Music Anagram, Enigma Date and Enigma Psalm Ciphers). The Music Anagram Cipher encodes the concluding phrase of Ein feste Burg using the opening phrase of Mendelssohn’s concert overture, a revelatory juxtaposition of beginning and ending phrases hinting at how to properly map the covert Theme over the Enigma Theme. This suspicion in reinforced by the Mendelssohn E.F.B. Cipher that encodes the initials for the covert Theme in reverse. The initials for Ein feste Burg are encoded by four divergent cryptograms – the Enigma Keys, Mendelssohn E.F.B., Letter Cluster, and Enigma Date Ciphers. This cryptographic evidence supports the conclusion Elgar elected to authenticate the secret melody by means of secret codes incorporated into the score. 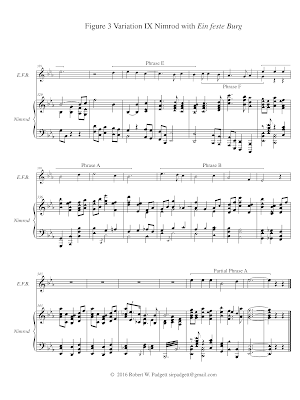 Having established a plausible connection between the Mendelssohn fragments and Luther’s Ein feste Burg, the next logical step is to map it a “through and over” the Enigma Theme. Before attempting to unravel that contrapuntal Gordian knot, it is much simpler to show how Luther’s hymn plays “through and over” Variation IX Nimrod (Figure 3). In this mapping Ein feste Burg is identical to Mendelssohn’s adaption with the exception of the application of free rhythm and a slightly expanded phrase structure. The standard phrase structure of Ein feste Burg is ABABCDEFB, and in this version it is enlarged to ABABCDEFABA’ with the repetition of Phrase A entirely before and partially after the ordinary concluding Phrase B. With Nimrod as both a thematic and structural variation on the Enigma Theme, there is no basis to preclude the same prospect for Elgar’s treatment of the absent Theme in this case. There are some brief pauses in the counterpoint with the longest occurring over four bars before Rehearsal 37 due to a repetitive transitional progression that sets up a dramatic restatement of Nimrod’s beginning phrase at Rehearsal 37 where the counterpoint resumes. There is a profusion of evidence in support of a counterpoint between Ein feste Burg and Nimrod. Shown by diamond-shaped note heads, 30 shared melody notes are present in 24 out of a total of 43 measures, or 56 percent of the movement with an average of 0.7 per bar. These relatively low figures are consistent with a counterpoint constructed to obscure the source melody because too many melodic conjunctions, especially those in sequence, would risk revealing too much of the absent Theme. In contrast to the paucity of melodic conjunctions are 144 shared harmony notes between Nimrod and Ein feste Burg’s melody signified by triangular shaped note heads. In all there are 174 note conjunctions dispersed over 39 of Nimrod’s 43 measures, or 91 percent of the movement for an average of just over 4 shared notes per bar. It was shown one of Elgar’s six conditions requires that the absent Theme play “through and over” the set of Variations. While numerous attempts have been made to chart various melodies over parts of the Enigma Theme, none has ever been shown to play efficaciously “through and over” any of the ensuing movements. Such a mapping of Ein feste Burg over any of the Variations is unprecedented. The prevalence of shared notes between Ein feste Burg and Nimrod confirms there are no protracted dissonances that would cast doubt on a plausible counterpoint. More importantly, these shared notes argue powerfully in favor of a counterpoint because they are sequential in character. There are some brief dissonant intervals in this mapping, yet these are consistent with Elgar’s compositional style as he employed some dissonance in his contrapuntal writing. For example, his sketchbook for the Cockaigne Overture Op. 40 reveals he conceived of the lover’s theme as a counterpoint to the “Wedding March” from Mendelssohn’s incidental music to A Midsummer Night’s Dream. 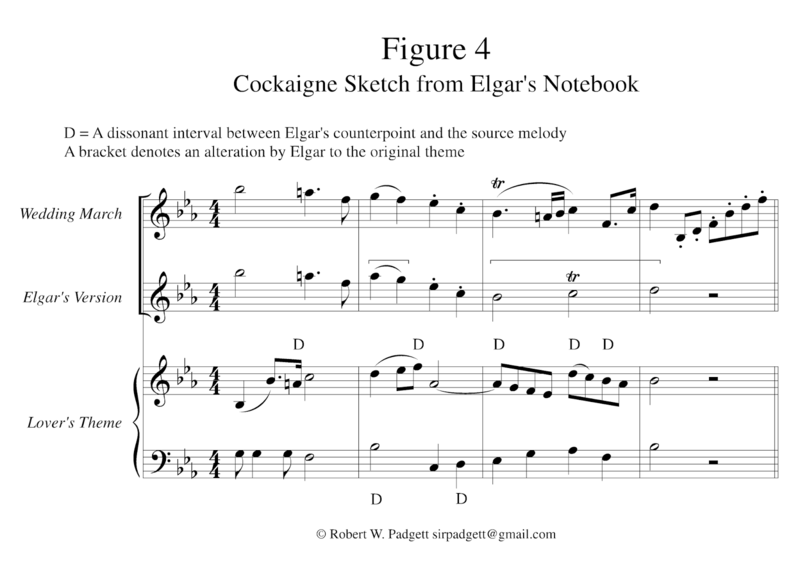 In a four measure excerpt Elgar’s counterpoint produces no less than eight dissonant intervals with the “Wedding March” (Figure 4). Dissonance is defined as any interval other than a unison, octave, perfect fourth, perfect fifth, major or minor third, and major or minor sixth. Elgar’s contrapuntal sketch of the lover’s theme obliterates the myth he would assiduously avoid any dissonant intervals between the principal Theme and the Enigma Variations. It also shows he was willing to alter the source melody. Multiple dissonances between the ostinato accompaniment and the Mendelssohn fragments in Variation XIII make it abundantly plain Elgar was perfectly content employing some dissonant intervals in his counterpoint. In Variation IX fragments from Ein feste Burg are found in short sequences of melodic and harmonic conjunctions. At Rehearsal 35 three consecutive melodic conjunctions (B flat, C, D) reproduce a fragment from Ein feste Burg’s D Phrase. Starting on the third beat two measures before Rehearsal 36, the bass line has three successive harmonic conjunctions (C, B flat, A flat) matching a fragment from Ein feste Burg’s F Phrase. In the bar preceding Rehearsal 36 Nimrod’s three melody notes (C, B-flat, A-flat) replicate that same fragment with the A-flat creating a melodic conjunction. It is remarkable those three unique notes (C, B-flat, A-flat) are exact same ones quoted in the A-flat major Mendelssohn fragments in Variation XIII. These examples comply with Elgar’s condition requiring the presence of fragments from the principal Theme within the Variations. Determining how Ein feste Burg plays over the Enigma Theme proved to be a far more daunting task. All attempts to map different versions of Luther’s hymn from beginning to end over the Enigma Theme produced too many protracted, abrasive dissonances. These efforts, while seemingly unproductive, revealed Elgar must have constructed his counterpoint in a less predictable manner. This is not entirely unexpected, for if it were that simple then it would not be what the title denotes, an enigma. In the 1899 program note Elgar explained the solution must remain unguessed, a qualification inconsistent with a straightforward mapping that could conceivably be guessed. Consequently, his counterpoint must be unexpected, and accordingly beyond the grasp of sheer conjecture. The Mendelssohn E.F.B. Cipher encodes the initials for Ein feste Burg in reverse, suggesting the unexpected method of mapping the covert Theme above the Enigma Theme in retrograde. Rather than mapping the missing melody forwards in the ordinary manner as everyone would naturally expect, it is conceivable Elgar took the opposite tact by crafting his counterpoint with the absent Theme played backwards. On an early sketch of the Enigma Theme he wrote “for fuga” above the first measure, an unmistakable indication he was contemplating several fugal possibilities. At Rehearsal 68 the Enigma Theme’s opening phrase overlays a counter melody constructed entirely of fragments from Ein feste Burg’s ending phrase (Figure 5). 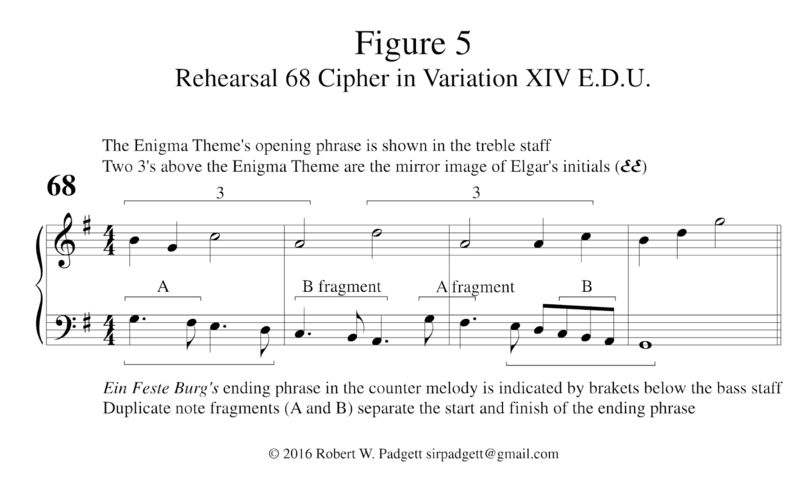 This contrapuntal smoking gun known as the Rehearsal 68 Cipher combines the absent Theme’s ending with the Enigma Theme’s beginning. According to Kent Kennan, Professor Emeritus of Music at the University of Texas at Austin, retrograde motion is rarely encountered in fugal writing. Martin Gough theorized Elgar may have “…disguised the melody, perhaps by putting it in retrograde or contrary motion, thus preventing easy recognition…” Given the relative infrequency of retrograde counterpoint, mapping the absent Theme in reverse would be a robust tactic to foil straightforward discovery. That no one has ever before attempted to map a candidate theme in retrograde over the Enigma Theme only reinforces this suspicion. Certain features of the Enigma Theme also hint at a retrograde counterpoint. First, the opening six notes of the cello line are the last six notes of Ein feste Burg in reverse order. Second, factoring in the bridge expands the Enigma Theme’s ternary ABA form to ABAC. When read phonetically, ABAC sounds like aback. That term was originally used to describe when a ship’s sails are blown backwards into the mast. In modern usage it refers to being taken by surprise. Both of these definitions – “backwards” and “surprised” – would exquisitely express a retrograde counterpoint over the Enigma Theme, not to mention Elgar’s proclivity for wordplay. Finally, the odd title denotes a riddle, something difficult to understand or explain. A retrograde counterpoint is like an enigma because when played in reverse, its original subject is obscured and not easily recognizable. In multiple ways the Enigma Theme alludes to an unexpected contrapuntal mapping in which the absent Theme’s beginning goes at the end, and its end at the beginning. 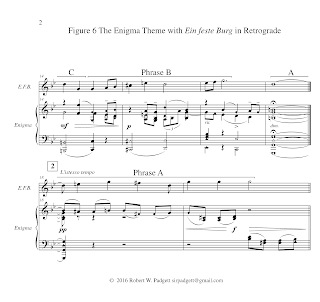 Starting in measure 19 and working backwards, Ein feste Burg is played in retrograde above the Enigma Theme (Figure 6). The reverse order of Ein feste Burg’s phrase structure without the usual repetition of the A and B phrases is BFEDCBA. The ending phrase (B) appears at both the opening and final cadence of the Enigma Theme with the starting phrase (A) played over the Bridge. The mapping models the minor and major modes employed by Elgar to camouflage the original key of the covert principal Theme as well as encode the initials for Ein feste Burg as shown by an analysis of the Enigma Keys Cipher. This mapping is made possible by applying free rhythm, an approach advocated by Dr. Clive McClelland who wrote, “Most of the solvers make the false assumption that the hidden melody fits in real time with Elgar’s theme; but…a precise metrical alignment with a well-known tune is unlikely.” Like the alternating minor and major modes, free rhythm serves to obscure the meter and structure of the covert melody. Shown by diamond-shaped note heads, 31 shared melody notes are present in 16 out of a total of 19 measures, or 84 percent of the movement for an average of 1.63 per bar with the highest concentration of six in measure 14. As was observed with the mapping of Ein feste Burg over Nimrod, the relatively low number of shared melody notes reflects a counterpoint created to obscure the foundational Theme. 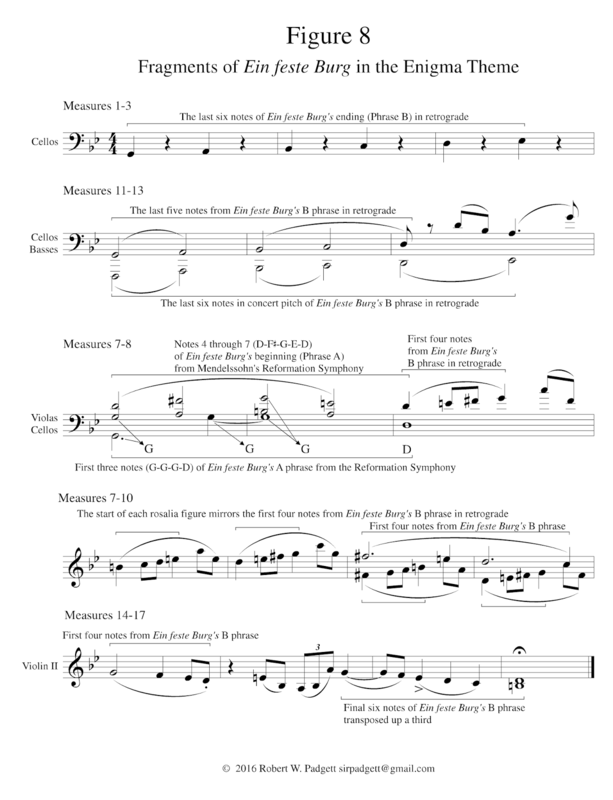 45 shared harmony notes shown by triangular shaped note heads are present in all 19 measures with an average of 2.37 notes per bar with the highest concentration of five in measures 13 and 15. In all there is a combined total of 75 note conjunctions dispersed over all of the Enigma Theme’s 19 measures with an average of 3.95 shared notes per bar. The comparatively even distribution of shared melody and harmony notes between Ein feste Burg and the Enigma Theme is prima facie evidence for a retrograde counterpoint with the source melody’s notes and phrase structure in sequence and intact. More importantly, this series of corresponding notes silences any objections based on too many lingering dissonances. The form of Ein feste Burg in this retrograde counterpoint is assembled from three versions, and for this reason represents an exclusive iteration. A side by side comparison of Luther’s original composition with adaptions by Bach and Mendelssohn reveals Elgar incorporated elements of all three to construct his hidden source melody (Figure 7). When combined with retrograde counterpoint, this “tribrid” was undoubtedly constructed to complicate detection while paying homage to three paragons of the German School. 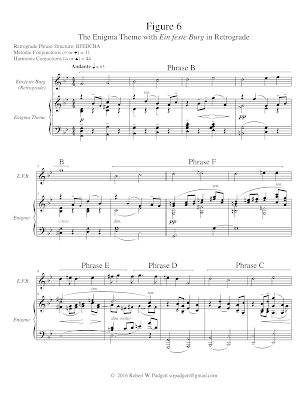 Phrase A in measures 17 through 19 comes from Mendelssohn’s more austere version characterized by rising and falling thirds, an attribute endemic to the A Phrase of the Enigma Theme. Phrase B in measures 14 through 16 bears the melodic imprimatur of Luther’s original hymn. Phrase C found in measures 12 through 14 matches both Bach’s and Mendelssohn’s versions which are virtually indistinguishable. 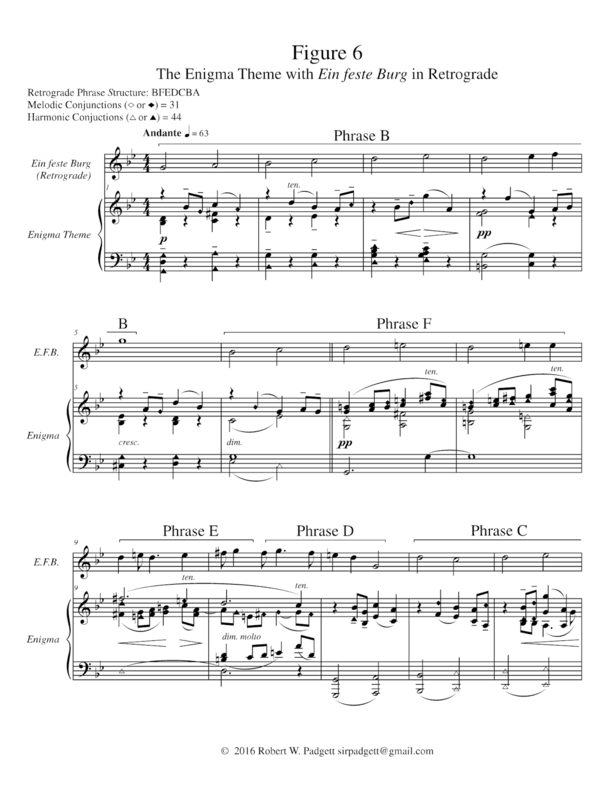 Phrase D in measures 10 and 11 reflects Luther’s original as well as Mendelssohn’s faithful replica. Phrase E in measures 9 and 10 is based on Mendelssohn’s more florid adaption. 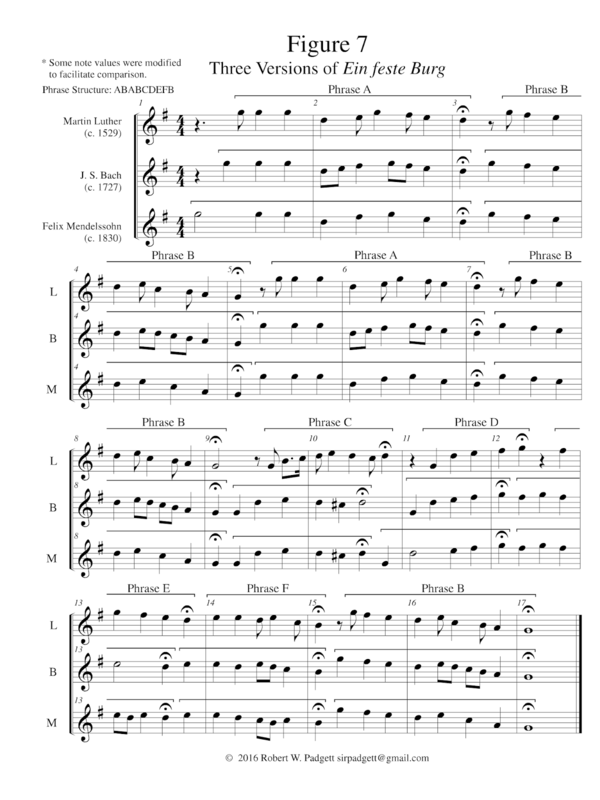 Phrase F in measures 6 through 8 and Phrase B in measures 1 through 5 both correspond with Bach’s rendering. This fusion of divergent renderings is more recognizable when Ein feste Burg is played forward and the Enigma Theme is in retrograde. 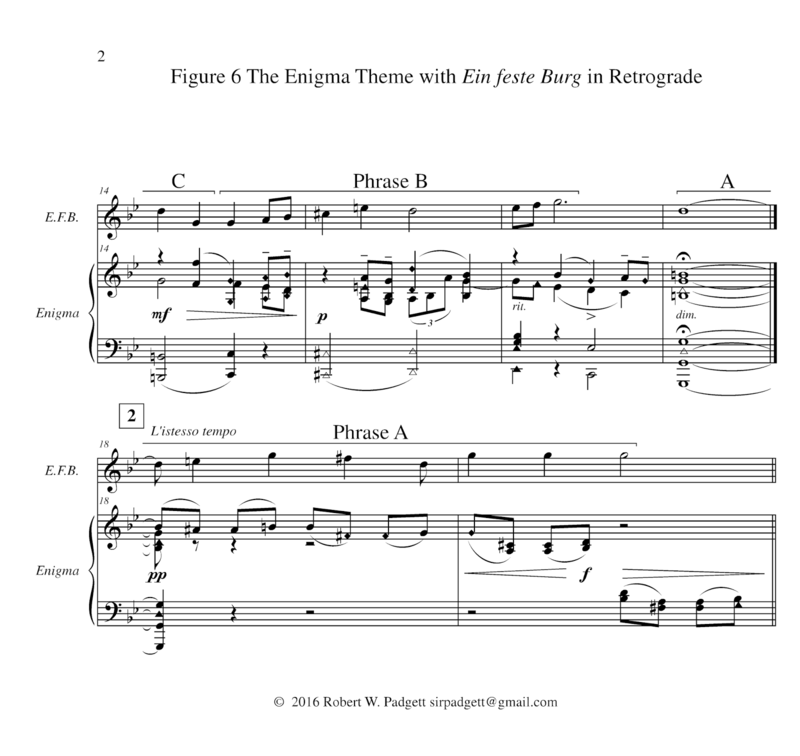 There are discernible fragments of Ein feste Burg in the Enigma Theme (Figure 8). In measures 1 through 3 the first six quarter notes in the cello line comprise the last six notes of Bach’s adaption in the minor mode of the concluding B phrase in retrograde. This same pattern is repeated with half notes by the cello and bass sections in measures 11 through 13. In this way the very foundation of the Enigma Theme’s score – the bass line – can be directly linked to the phantom melody. Fragments of the opening A phrase appear in the contrasting G major section. Starting on the first beat of measure 7 and continuing through the first beat of measure 9, the upper viola line performs a fragment consisting of rising and descending broken thirds (D, F sharp, G, E, D) returning stepwise to D. In an augmented form this fragment uses the same note sequence from the second half of the A phrase from Mendelssohn’s version of Ein feste Burg in the original major mode. The first half of that same opening phrase (G, G, G, D) is played concurrently in an augmented form by the viola and cello sections. At the beginning of measure 7 the cellos play a G pedal tone as the violas play a G an octave higher. On the fourth beat of measure 7 the cello line rises by an octave to a second G that ties over the bar line to a whole note G in measure 8. On the third beat of measure 8 a third G is played by the violas an octave above the sustained G held by the cellos. At the outset of measure 9 the cellos descend by a fourth from G to D. In counterpoint the layering of a subject over itself is known as stretto. The last four notes of Ein feste Burg’s ending phrase in retrograde are an integral component of the rosalia figure in measures 7 through 10. This B phrase fragment in retrograde is played by the first clarinet on the first three beats of measures 7 and 8, and a third time in thirds by both clarinet parts on the first three beats of measure 9. The second violins play this fragment a third lower with the clarinet in measure 7. 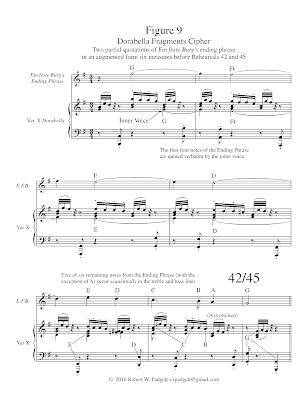 A tonal version of the first four notes of Ein feste Burg’s B phrase are played in an augmented form by the first flute and oboe in measures 9 and 10. It is possible to reconstruct a tonal version of Ein feste Burg’s B phrase in the Enigma Theme’s B section using thematic material from measures 9 and 10. The first four notes of Ein feste Burg’s ending B phrase in G minor are played in measure 14 by the clarinets, first French horn, second violins, violas and cellos. 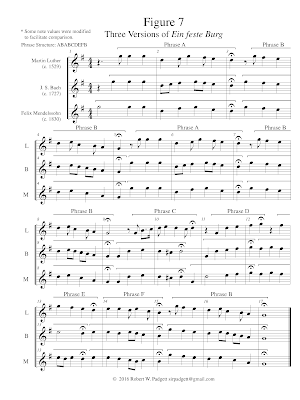 Starting on the fourth beat of measure 15 the final six notes of that ending phrase transposed up a third are performed by the first French horn and second violins. 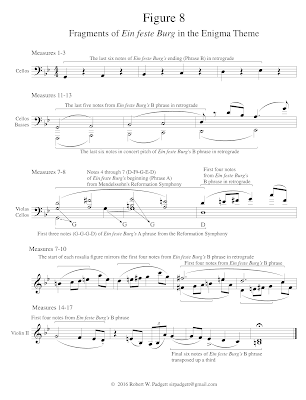 Five of those same six notes are also performed by the clarinets and cellos in measures 15 through 16. As the covert principal Theme Ein feste Burg resolves a host of perplexing questions surrounding the Enigma Variations, one of the foremost being Elgar’s persistent refusals to divulge the mystery tune. His faith inspired such sacred and predominantly Catholic works as The Light of Life (Lux Christi) Op. 29 and The Dream of Gerontius Op. 38, an oratorio that Charles Villiers Stanford complained “stank of incense.” No one would ever suspect a practicing Roman Catholic would ever cite the battle hymn of the Reformation, a work composed by a heretic excommunicated by the Pope. This dichotomy accounts for his unconventional approach of quoting it clandestinely via a counterpoint. As a paean of the German army, Ein feste Burg was sung before battle to embolden their troops and quoted in works like Wagner’s Kaisermarsch to commemorate their triumphs. Elgar’s increasingly obstinate refusals to disclose the hidden theme following the outbreak of World War I is easily understood through the lens of the tragic slaughter of millions of British soldiers by the German war machine. After the guns of August began to roar across continental Europe in 1914, it was impossible for Elgar to concede any real or perceived sympathy for anything Teutonic without inviting social and professional ostracism. To do so was strictly verboten. There are two interconnected anomalies associated with Variation X that are effectively resolved by Ein feste Burg. The first is Dora Penny’s inability to guess the tune despite Elgar’s insistence, “I thought that you of all people would guess it.”  The second is Elgar’s cryptic remarks regarding this movement that the “inner sustained phrases at first on the viola and later on the flute should be noted.” In a classic play on words, Elgar’s use of the term “noted” openly invites one to scrutinize the actual notes of the inner voice. The reason she should have been able to guess the tune is the first four notes of Ein feste Burg’s ending phrase (G, F-sharp, E, D) are twice stated sequentially in an augmented form by the inner voice beginning six bars before Rehearsals 42 and 45 (Figure 9). This treatment of Ein feste Burg mirrors how in 1897 Elgar inventively quoted an augmented form of God save the Queen in the inner voice of the 5/4 waltz from Tchaikovsky’s Pathétique. Martin Luther was a flutist, and in deference to his chosen instrument Mendelssohn introduces Ein feste Burg in the Reformation Symphony on the flute. Elgar follows this example in Variation X by having the inner voice quote the first four notes of that hymn’s ending phrase on the flute. This cryptogram is known as the Dorabella Fragments Cipher. As the daughter of an Anglican Rector and missionary, Dora’s life experience enjoyed an intimate connection with Ein feste Burg which is included in the Anglican hymnal. Among Elgar’s friends when he composed the Variations, she was the most active musically. In her biography she explained, “I was so mixed up with tunes in those days; Choral music; Church music, and orchestral music — and then my own solo singing, scenes from opera, songs, ballads, and so on.” Ein feste Burg appears in all of these musical genres, so there was ample opportunity for her to hear if not perform that famous theme. This was undoubtedly the case following the Bach resurgence in England beginning in the 1870s. Published in London in 1892, The Dictionary of Hymnology states regarding Ein feste Burg, “It has now become well-known in England, and in its proper form is included in the C. B. [Chorale Book] for England, 1863.” That Elgar used the exact same terminology (“well-known”) to describe the absent Theme when responding to an inquiry by Troyte is a remarkable coincidence. In the Royal life of England, Ein feste Burg was eminent and esteemed as evidenced by the coronations of 1902 and 1911, global events attended by leaders and representatives from around the world when the sun did not set on the British Empire. At the 1902 coronation of King Edward VII, Ein feste Burg was performed multiple times, first as a hymn during the processional, and again in Wagner’s Kaisermarsch. Ein feste Burg was performed at the 1911 coronation of King George V and Queen Mary, first as processional music and then in the homage anthem composed by Sir Frederick Bridge that made “liberal use of Ein’ feste Burg.” It is beyond dispute the English public in general and Dora Powell in particular were exceedingly familiar with Luther’s renowned hymn. She may have been able to guess the tune, but Elgar stubbornly refused to volunteer what could only be realized by cracking his ciphers. This analysis has demonstrated Ein feste Burg satisfies all six of Elgar’s conditions concerning the relationship between the absent Theme and the Enigma Variations. As a retrograde counterpoint is successfully plays “though and over” the complete 19 measures of the Enigma Theme. It plays forward in the ordinary manner over Nimrod, an unprecedented feat for any other candidate melody. It is famous. Although silent in its entirety within the Variations, there are discernible fragments of it in the Enigma Theme, Variations IX, X and XIV. Multiple cryptograms in the orchestral score consistently implicate Luther’s most popular hymn as shown by the Enigma Keys, Nimrod, Mendelssohn Fragments, F.A.E., Mendelssohn E.F.B., Dorabella Fragments and Rehearsal 68 Ciphers. In hindsight Elgar’s seemingly ordinary remarks to F. G. Edwards in a letter dated October 21, 1898, regarding a projected “Gordon” symphony take on a new aura of significance. Elgar wrote, “’Gordon’ simmereth mighty pleasantly in my (brain) pan & will no doubt boil over one day.” Something symphonic did indeed erupt on that fateful day, for later that evening Elgar first performed the Enigma Theme at the piano for his wife. The appearance of the word “mighty” in his correspondence in connection with an orchestral work on that day of days is an extraordinary coincidence if not a proverbial slip of the pen. To learn more about the secrets of the Enigma Variations, read my free eBook Elgar’s Enigmas Exposed. Kennedy, The Life of Elgar, 67. Harper-Scott, Elgar: An Extraordinary Life, 49. The Musical Times 80 (1939), 60. Original 1899 program note by C. A. Barry citing an unsourced letter by Elgar. Kennedy, Portrait of Elgar, 66. The Musical Times (October 1, 1900), 647. Turner, Elgar's 'Enigma' Variations - a Centenary Celebration, 51. Buckley, Sir Edward Elgar, xi. Buckley, Sir Edward Elgar, ix. Turner, Elgar's 'Enigma' Variations - a Centenary Celebration, 146. Elgar, My Friends Pictured Within, 6. Kennedy, Portrait of Elgar, 25. Rushton, Elgar: ‘Enigma’ Variations, 74. Harper-Scott, Elgar: An Extraordinary Life, 46. Rushton, Elgar: ‘Enigma’ Variation, 8. Longfellow, Hyperion: A Romance, 262. Longfellow, The Complete Poetical Works of Henry Wadsworth Longfellow, 463. Gough, Variations on a Canonical Theme – Elgar and the Enigmatic Tradition, 33. McClelland, Shadows of the evening: new light on Elgar’s ‘dark saying’, 43. Kenyon, Elgar: An Anniversary Portrait, 14. Powell, Edward Elgar: Memories of a variation, 23. Elgar, My Friends Pictured Within, 24. The Musical Times 38 (1897), 741. Turner, Elgar’s Enigma Variations: A Centenary Celebration, 112. Julian, A Dictionary of Hymnology, 324. The Musical Times, September 1, 1902, 577-578. Richards, Imperialism and music: Britain, 1876-1953, 108-109. Moore, Elgar and His Publishers: Letters of a Creative Life, 94. Remember also that the King changed his family's German name (inherited from Prince Albert) to Windsor. Wow, RP. Whether or not this is the solution....you've successfully edified at least this reader! The fact that this subject is so far beyond my musically-illiterate ken AND yet I'm still riveted reading it speaks volumes about your writing ability. And I must say....it's so great to read your work in your own plutogogue-free space!